Stage 6 was set up to be the typical sprinter stage, and it delivered with a big bunch sprint at the end of a relatively uneventful 216 km. 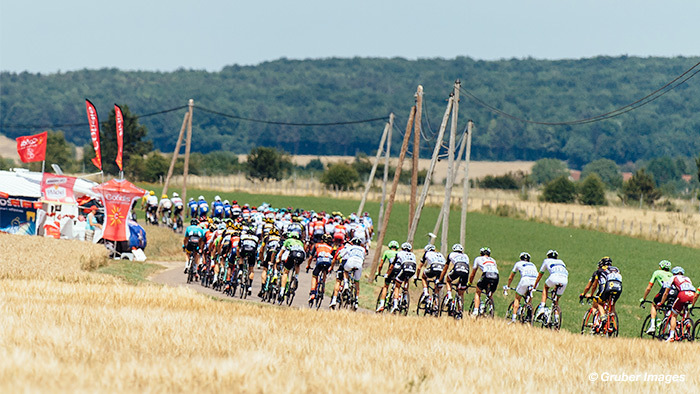 An early break of three riders went on the attack from the first kilometer which consisted off Perrig Quemeneur (Direct Energie), Vegard Stake Laengen (UAE Team Emirates) and Frederik Backaert (Wanty-Groupe Gobert). These three riders spent the next 213 km in the lead before being brought back on the approach to the finish. The bunch sprint was fast and thankfully incident free. Quick-Step Floors tried to take control for Marcel Kittel in the last 2 km, but then Edvald Boasson Hagen (Dimension Data) went for a long sprint with about 500m to go, only be swallowed up in the last 200m by a flying Kittel, who went on to take his second victory in this year’s Tour de France. Let’s take a look at Marco Haller (Katusha-Alpecin), Alexander Kristoff’s lead-out man heading into the day’s final sprint and compare that to former Polka-Dot Jersey wearer Nathan Brown’s more conservative efforts for the day. Katusha-Alpecin, 14th s.t., lead-out man for Alexander Kristoff who finished fourth today. To learn about these TrainingPeaks metrics, click here. The overall priority for Haller was to make sure he was in pole position with his team leader, Alexander Kristoff, in the last 2 km and that he had conserved as much energy as possible throughout the day in order to have that big punch of power at the end. The first three hours of the race were ridden at a relaxed pace for those in the comfort of the peloton. See below for a breakdown on the first three hours of racing. With only two categorised climbs today and not enough wind to cause any nervousness in the bunch, the riders were able to go at a moderate pace for most of the stage. The two category 4 climbs at kilometer 69 and kilometer 154.0 were the major obstacles. There was also the intermediate sprint, which is critical for any rider with the ambition to win the Green Jersey: With Kristoff currently in fifth place in this classification, it was crucial for him to gain points at this mid-race sprint. It was Haller, who again was the main lead-out man for Kristoff, who helped him gain position in the fast run into Colombey-Les-Deux-Églises at the 135 km mark. In the 1 km leading up to the sprint Haller produced a one minute effort, averaging 563w, 7.05 w/kg as the field rode at a very fast average speed of 60.2kph, hitting a max of 70.5kph on flat terrain. Haller’s final effort to position Kristoff saw him do a 30 second effort at 862 w, 10.9 w/kg, peaking at 1315w, 16.5 w/kg. Kristoff finished 8th in the sprint, after the the first three places had been taken by the leading break. The big push for position and to gain a dominance at the head of the bunch started with around 10km to go, at this point it was easy to see the teams and their lead out trains getting into formation and bringing the lead sprints to the head of the peloton. Haller was one of the last riders in the lead out train, which meant he was able to sit on his teammates wheels and save his last punch for the final kilometer. We can see from his data that it was still an effort to hold the wheels and keep pace with the front. On the final kilometer, the Austrian came to the head of the race as the final piece in the lead-out train. With Edvald Boasson Hagen (Dimension Data) determined to mix things up in the absence of teammate Mark Cavendish, he went for a surprise long sprint trying to catch some of the lead-out riders. Thankfully, Haller was the rider on his wheel at this point and he produced a MASSIVE effort to close the small gap to Boasson Hagen’s wheel and hold it, the grimace on Haller’s face said it all as he fought to keep control at the front. The effort produced by Haller enabled the sprinters to keep in touch with the flying Norwegian and kept his team leader in contention for the final. In the end, Kristoff was to come in fourth and just on the heels of André Greipel (Lotto-Soudal) in this hard-fought finish. Compare this effort of a lead-out rider to that of someone with very different goals for the day. The former Polka Dot Jersey wearer Nathan Brown (Cannondale-Drapac) was able to save important energy today, likely for the tough climbs up ahead in the Tour. He saw little surges in power until that last few kilometers of the day. This will likely serve him well once the route heads up into the mountains. As you can see, compared to Marco Haller, Brown never really had to go into the red, aside from a short effort on that last short ascent before the finish. With today being a less strenuous day for the GC contenders and a generally textbook sprinter’s stage, many will have been happy to have avoided any crashes or other incidents. For Haller and his team to be to the fore on today’s stage and having one of the better lead-outs compared to the other teams, their performance has shown they are capable at delivering their team leader to the finish in great position. Haller has proven that he has the power to support his captain. With some luck and slightly better timing I believe Kristoff will be in contest for more wins in the coming sprint stages.